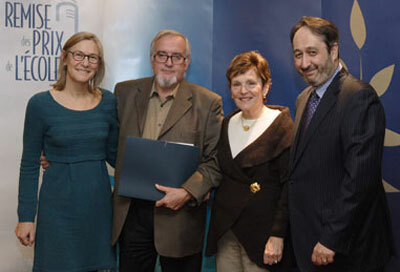 The School presented its 2009 research and teaching awards at a ceremony attended by faculty and management members and their guests on November 18, saluting the excellence of HEC Montréal faculty in these fields. The award ceremony was preceded by the traditional tribute to the contribution by professors who retired in the past year , and acknowledgement of their new status as honorary professors. The new honorary professors are: Jean-Pierre Le Goff, of the Institute of Applied Economics, Maurice Lemelin and Thierry Wils, of the Department of Human Resources Management, Pierre-B. Lesage (Secretary General of the School from 1995 to 2007), and Michel Provost and Francine Séguin, of the Department of Management. This year’s Jean Guertin Award (Grand Prize for Teaching Excellence) crowns the teaching career of Professor Alain Chanlat , who has spent over 40 years educating several generations of students at all university levels. A Full Professor in the Department of Management, Mr. Chanlat began his career at HEC Montréal in 1967. Since then, he has worked tirelessly to build bridges between management and the social sciences. Recognized as someone who helped introduce interdisciplinarity and humanism in management, he has always endeavoured to take an innovative approach in his teaching. At HEC Montréal and elsewhere around the world, he has adopted the principle of recognizing the diversity of groups and the singularity of individuals. Over the space of four decades, Alain Chanlat has taught at the BBA, specialized graduate programs, MBA, MSc and PhD levels. Some thirty PhD and Master's theses have been written under his direction or are now being prepared. His name appears in about ten other doctoral theses as a member of the thesis supervisory committee. His students greatly appreciate his teaching skills, his ability to appeal to both their heads and their hearts, his openness and his way of venturing off the beaten path, among other qualities. His colleagues, for their part, acknowledge his impact on management teaching and the efforts he has devoted to organizing lectures and international symposia. The content of these symposia and lectures, and the entire content of the humanities seminar and the three books he has written, are available on the Website of the Humanism, Management and Globalization Centre, which he co-founded and still directs today. While he has devoted most of his career to teaching, Alain Chanlat has also found time for important research work, acting as a business consultant, and serving the HEC Montréal and outside communities. Christiane Demers, Director of the Department of Management, Alain Chanlat, winner of the Jean Guertin Award, Christiane Robert, wife of the late Jean Guertin, and HEC Montréal Director Michel Patry.